I knew the collection was impressive–the website boasts that the Neue Nationalgalerie is one of the most important museums in Europe. 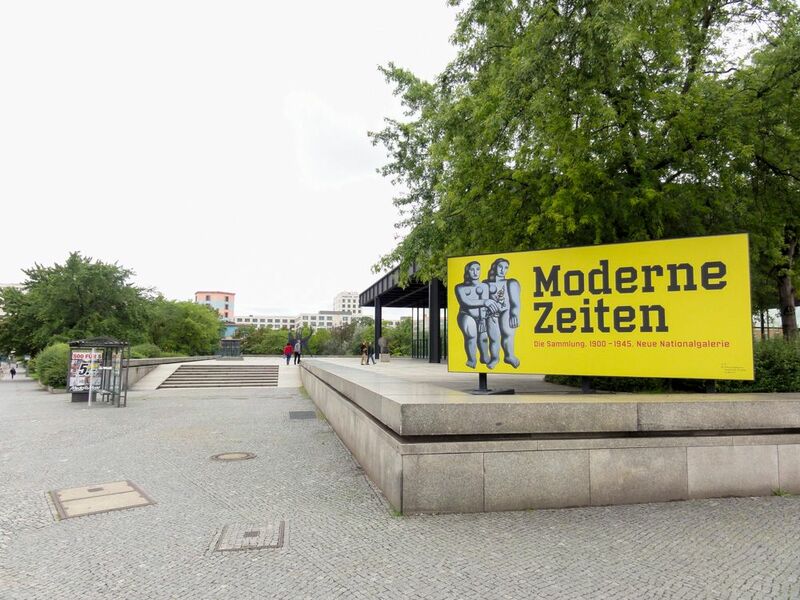 Yet, it was that gloomy Sunday that prompted me to go to the museum; I had heard there was an excellent selection of German expressionism, and I thought that just maybe this interminably dismal Berlin weather could be cured with a little color. I wasn't disappointed. The first paintings I saw swelled with color and were possibly my favorite in the entire museum. Two artists had depicted the same Jewish song, the Had Gadya (One Little Goat), which is sung at the end of the Passover Seder. The "cumulative" story follows a father who buys a goat that is then eaten by a cat that is then bitten by a dog that is then beat with a stick, and so on. The destruction continues and continues until God steps in, intervening, you know, divinely, as he is wont to do. And although God does punctuate the last scene of each artist's depiction, i.e., the series first done by El Lissitzky (1890-1941) in 1936 and the later one done by Frank Stella (1936-) in 1984, what must the atheist think, if she acknowledges this accumulation of goat-cat-dog destruction but without hope of divine intervention? What if she can't accept that tenth verse? Stella's series gives a riposte insofar as he is able to stretch the most whimsical forms over dire situations. And then they're not that dire. And how does a cat eat a goat? Besides the wonder of these first paintings, the architecture of the gallery is remarkable in itself. Designed by Mies van der Rohe in 1968, the museum is said to be the architect's last great building, opening a year before his death. Naturally, the building reminded me of the towers of glass and steel that stand before Lake Michigan in Chicago; however, rather than the pricey condos and offices that occupy those spaces, this Berlin gallery has been constructed with the experience of "looking at art" in mind. This experience, which can often become laborious, leaving you feeling rushed, bored, trapped, claustrophobic, or, as Ferlinghetti puts it, "constipated," this museum is noticeably different. 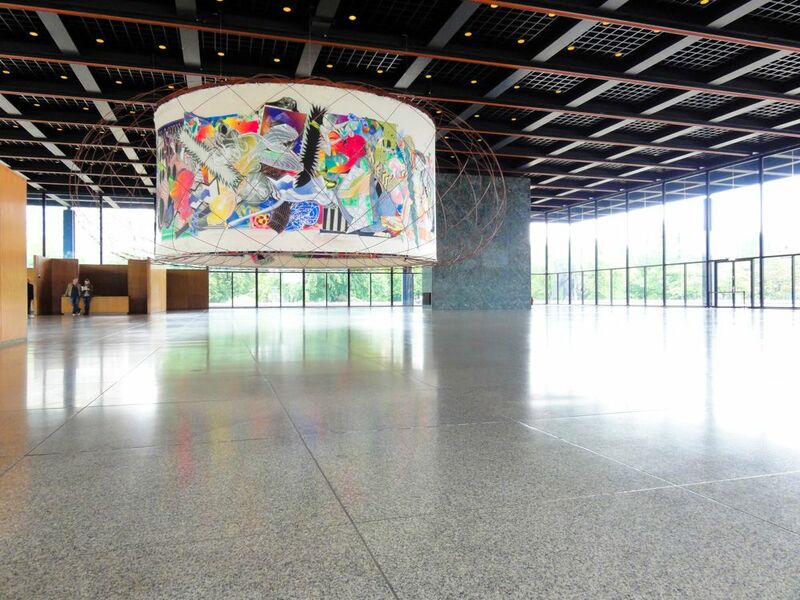 In the Neue Nationalgalerie, the whole first floor is reserved for changing installations, such as the one above, The Michael Kohlhaas Curtain, designed by Frank Stella and Spanish architect and engineer, Santiago Calatrava. 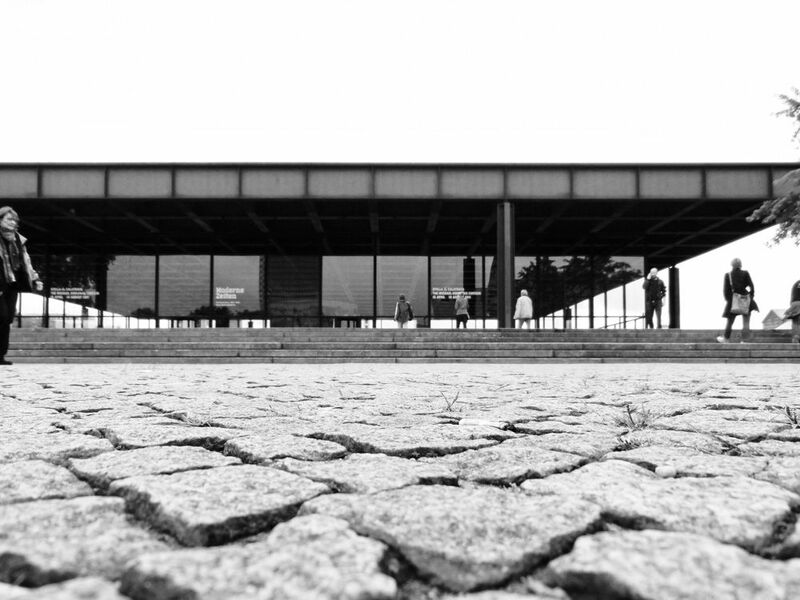 What Mies is so good at comes through here: the creation of space. You experience space that is light and freeing. Artworks don't come here to die, they haven't been sent to solitary confinement, but are here let be. The gallery, however, is completely underground. But you don't feel trapped in a cavern, because another feature of the museum is the utilization of natural light that both illuminates the paintings and ensures their integrity isn't compromised in any way. These aspects of the building's design come together to provide an ideal aesthetic experience; and, if it all still does become a bit too much, you can just sit down in any of those iconic Mies van der Rohe Barcelona chairs. And, although I'm not sure why, I didn't have to pay admission. It might have been because I'm a Goethe-Institut student, but more likely, the woman at the ticket desk, recognizing what a fine admirer of art I surely am, knew what a travesty it would be to make me pay. Let other museums take notice. The art of Peter Karklins is unsettling, beautiful, and provocative.